There are many ways in which the subject of youth work is talked about. For example, we might discuss the impact of youth work on the lives of young people or, perhaps, take a historical view of what youth work used to be and how it has changed. Much current discussion of youth work is related to how it retains its values when faced with the threat of cuts to funding. At the same time, youth work has a history of being anti-academic and anti-theoretical (Smith, 1988 cited in Seal and Frost, 2014: 8); with youth workers happy to take a more pragmatic, common-sense approach to discussion about youth work and what it ‘ought’ to be. We want to challenge you to fight such notions of anti-theory and to take a more philosophical approach which we believe will help you to be more considered in your thinking; helping you to argue clearly and precisely about the importance of youth work and the way you work with young people. In turn, we want to argue that thinking and working philosophically can also provide an opportunity for young people to think critically about their ideas and experiences; there is a need to move beyond discussions based on sentiment, common-sense ways of thinking and the passive acceptance of social norms. 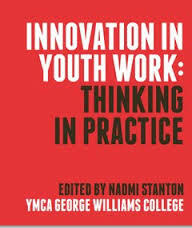 To read in full, hover your cursor on This is Youth Work : The Book in the brown header at the top of this page and click on Innovation in Youth Work : Thinking in Practice. This will take you to a designated page, where the full pdf of the book can be viewed. Simon’s and Mike’s succinct chapter is contained within pages 18 – 21. As ever responses welcomed. Previous Is this an opportunity for young people to influence Labour Party policy? Next IDYW February Mailing – Summary of What’s Bothering Us and What We’re Trying to Do!